The update was initiated by a "charrette," a week-long public visioning and design process that occurred on June 10-14 and 18, 2013. Particular emphasis was given to the redevelopment of the former Calvert Middle School property and adjacent lands along MD Route 2/4 up to Calvert Memorial Hospital. In preparation for the charrette, county staff held a five-part seminar series. View the pre-charrette seminar series materials. Watch the video of the pre-charrette session. 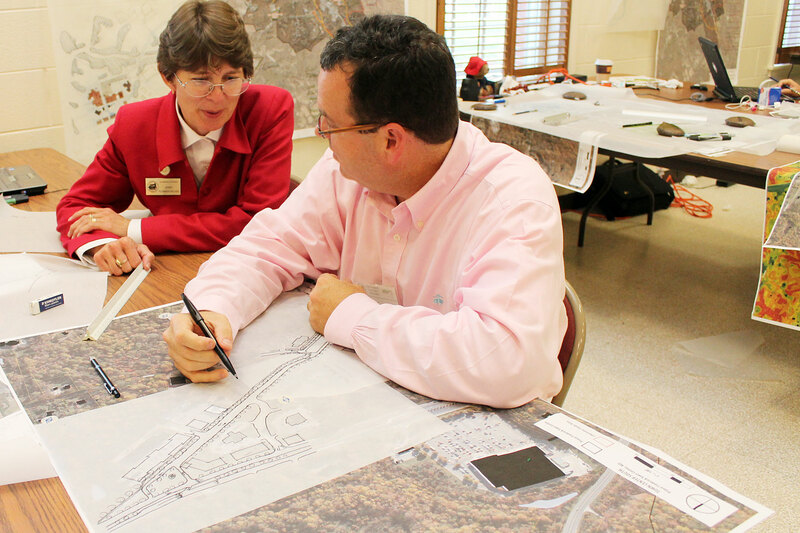 Jenny Plummer-Welker of Calvert County Community Planning and Building goes over maps and data with Wade Walker from the Lawrence Group during the charrette. Watch the video of the Day One presentation. Thomas Hylton, a Pulitzer prize-winning journalist, wrote "Save Our Land, Save Our Towns." A native of Wyomissing, Pa., he hosted an hour-long public television documentary of the same name. Hylton serves as an advocate of traditional towns. In 2008, the Calvert County Planning Commission hosted Mr. Hylton, who spoke on comprehensive planning and traditional town planning. Mr. Hylton’s video is available for viewing.